Found 20 file extension associations related to Alibre Design Professional and 2 file formats developed specifically for use with Alibre Design Professional. Get the idea to working prototype fast. 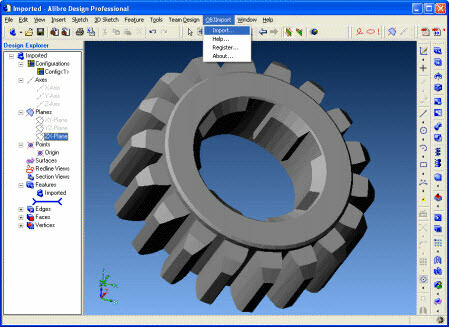 Alibre Design offers a rich set of 3D modeling tools for the fast creation of complex geometry. Bottom-up and top-down design allows you to work efficiently. Everything you make is instantly editable, allowing for fast iterations. If your design calls for sheet metal Alibre Design offers advanced modeling tools that make it easy. Flanges, closed corners, complex lofts, dimples, and many other tools combined with instant flat patterns get accurate and fast results. If you need more information please contact the developers of Alibre Design Professional (Alibre Inc.), or check out their product website.